Buying 1/10 oz Platinum American Eagle Coins are a great way to own highly recognized yet tiny government guaranteed platinum bullion coins at a price close to the world’s fluctuating platinum spot price. American Eagle Platinum Coins are the the first platinum coins to be issued by the US Mint. The one tenth ounce Platinum American Eagle Coin carries a $10 USD legal tender face value yet they are bought and sold based on their .9995 platinum precious metal content. Bearing the motif of an eagle and Lady Liberty, the platinum coin celebrates the eternal American values of freedom, pride and dignity. In each of its issued sizes (1 oz, and fractional platinum coin sizes of 1/2 oz, 1/4 oz, and 1/10 oz), the platinum coin's troy ounce weight and precious metal content are guaranteed by the Government of the United States of America and enforced by the US Secret Service. 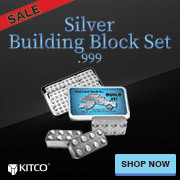 You can store your 1/10 oz Platinum American Eagle Coin safely and securely with Kitco Allocated Storage. Kitco offers you global options for gold, silver and platinum bullion storage that is fully segregated, insured and allocated. Kitco's network of top-tier vaults includes some of the most secure storage facilities in the world, in Canada, Hong Kong or the United States (COMEX approved). Cayman Islands storage is also available (certain conditions apply). Find out more about keeping your gold, silver and platinum purchases secure, with our Global Precious Metals Storage Solutions. Why buy 1/10th oz Platinum Eagle Coins from Kitco?